Read all about it. The here and now of bourbon. Featuring articles covering the lifestyle surrounding bourbon and happenings of the industry. Have a bourbon story to suggest? Contact us. ‘Tis the season to be holly, jolly, and everything in between! Whether you’re looking for a fun way to spice up your holiday party or want to make family Christmas a little extra cheery, these bourbon-soaked cherries are sure to be a hit! Have you ever wondered what a bartender or seemingly knowledgeable drinker at a bar means when they say, “I’d like a wheater,” or “Give me some rye whiskey”? They’re obviously referring to one of the grains used in the ingredients of the bourbon or whiskey in question. But do you know what effect different grains have on the taste of your bourbon? 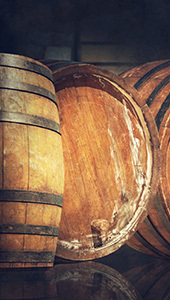 Do you know what grains can and can’t be used in the making of bourbon? Bourbon’s Core Ingredients: Bourbon is usually made up of at least three grains, though more can be used. By law, the grain mixture—or mash bill—must be 51% corn. So that’s the primary grain. The second most commonly used is malted barley, which is the only grain used in Scotch and contains important enzymes to fuel the fermentation process. The third grain is typically either rye or wheat, which often serves as the first broad taste differentiator in types of bourbons. A rye mixture produces a spirit with more of a spiciness, which often brings about flavors of cinnamon, licorice, nutmeg or pepper in the taste. A wheated bourbon is generally described as sweeter and softer on the palate, which can result in a taste that can include fruits, caramel, vanilla, chocolate or even honey. In some cases, a mixture can be more than three grains and contain both wheat and rye. In these whiskeys, the distiller is likely experimenting or has landed on a combination of grains to produce a specific flavor. Keep in mind that there are different varieties of rye and wheat, so the combinations of three- or four-grain bourbons are almost endless, giving distillers an entire universe of possibilities. Other Grains: The recent bourbon boom has led to lots of experimentation and introduced several other grain variations to the bourbon world. As of 2018 there are bourbons on the market with rice, triticale, millet, spelt and more. There is no right or wrong set of ingredients as long as the grain bill has at least 51% corn and the finished product makes someone say: “I’ll have another!” To learn more about how bourbon is made, visit our handy guide at the American Bourbon Association’s website. The American Bourbon Association is not affiliated with these websites and does not sponsor, endorse, approve or have any responsibility for the content appearing on these websites.